Don't be left behind. Find out when the next road trip to a surf site is or when competitions are scheduled. General Luna, Siargao Island , 16 August 2010 --- Now in its sixteenth year, the Siargao International Surfing Cup at Cloud nine is Philippines’ longest-running surfing competition, making the country popular as among the world’s sought after surf destinations. This year’s invitational event,that will run from September 24th through 30th, is the most anticipated event of the Philippine surf season featuring the Philippines’ best along side with some foreign surfers. The tournament is expected to field 32 surfers including 12 of Philippines’ all-time local surfers. This invitational format, along with the allure of the wave at Cloud 9 and a 350 thousand pesos or almost US$7,500 total prizemoney plus trophies, makes the Siargao Cup the most anticipated event of the Philippine surf season. This year Siargao event will continue to infuse the contest with other activities to make it more festive and appealing to both local and foreign surfing enthusiasts and beach lovers. Aside from the top-level surfing competition, the festival will also feature the Siargao skim boarding challenge, a street dancing festival, agri-aqua trade fair and exhibits, neo-ethnic dance competition, fashion show, San Miguel Corporation’s street parties, and other sports activities. Another main feature of this year’s festivity is the holding of the 12th Siargao’s national surfing cup wherein local surfers from Baler, Aurora, Camarines, Samar, La Union, General Luna and other parts of the country are expected to compete. This national event will kick-off on September 17 and end on September 21 wherein Philippines’ top 12 surfers will be chosen to become the official representatives of the 16th Siargao International Surfing Cup. Two hundred thousand pesos or more than US$4,000 are up for grabs by the Filipino surfers for both open and junior categories. The tournament is part of the “Siargao Surfing Festival 2010” which was formally launched in General Luna, Surigao del Norte, last August 5th. 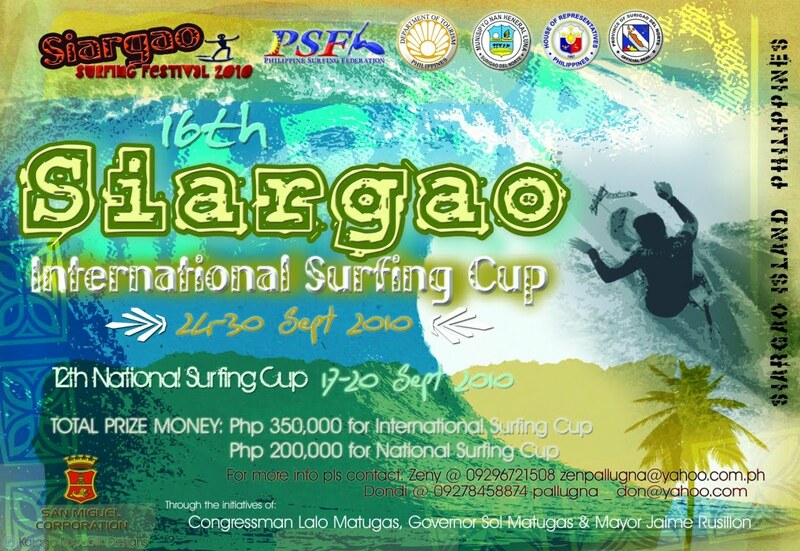 According to Surigao del Norte’s Governor Sol Matugas, this “Siargao Surfing Festival 2010” is a come-on event to promote tourism and showcase Surigao’s natural wonders. 16th Siargao International Surfing Cup is proudly presented by Surigao del Norte’s provincial government and House of Representatives, General Luna’s local government unit, Department of Tourism and the Philippine Surfing Federation (PSF). For more information, your may get in touch with PSF Secretary General, Zeny Pallugna, at +63 927.8458874 or +63 929.6721508 or email her at zenpallugna@yahoo.com.ph. (by Zeny Pallugna). The National competition will be run from 17 September to 23 September. The top eight finishers will move on to compete in the Cloud 9 Invitational. Surfersvillage Global Surf News, 24 July, 2007 : - - Gold Coast -- Surf company Billabong announced that in 2007 it will secure sponsorship of the Billabong Cloud 9 Invitational at the island jewel of Siargao, Philippines in September. The three-year deal ensures that Billabong has naming rights sponsorship of the Philippine’s biggest surfing event until 2009. Siargao’s ‘Cloud 9’, a powerful hollow right-hander, will provide an idyllic setting for the who’s who of world surfing, contestants coming from as far a field as Australia, Bali, Tahiti, Hawaii, Japan and the USA. Due to Siargao’s proximity to the Philippines, big swells from the Pacific Ocean roll in from the second deepest stretch of water in the world to create flawless hollow barrelling waves. Boasting US$20,000 in prize money, the exclusive invitational event offers a world-class field of 48 invited surfers a chance to compete at one of Asia’s hottest surfing destinations. Billabong General Manager South East Asia, Chris James, said sponsorship of the Billabong Cloud 9 Invitational is a continued commitment to promoting the sport of surfing throughout the region. The 2007 line-up includes high profile surfers such as Mark Matthews (Maroubra, NSW, AUS), Jamie O’Brien (Oahu, HAW), Manoa Drollet (Tahiti), Dylan Longbottom (Gold Coast, AUS), Makua Rothman (Oahu, HAW), Ryan Augenstein (California, USA), Luke Dorrington (Gold Coast, AUS) and Asher Pacey (Gold Coast, AUS). The seven-day tournament will run from Monday September 24th to Sunday September 30th. The opening ceremony will be staged on Monday 24th with competition commencing that day. The tournament contest site is Siargao Islands ‘Cloud 9’, a powerful hollow right-hander that has been hailed as one of the ten best waves in the world and has been frequently compared to the renowned surf of Hawaii and Indonesia. The Billabong Cloud 9 Invitational is proudly supported by the Provincial Government of Surigao Del Norte with Support from Smart Communications, San Miguel, The Department of Tourism Philippines, Asian Spirit and Coca Cola. Hey everyone! 3rd Siargao (Cloud 9) Wahine event is finally set on 30 May to 3 June 2007 with a total prizemoney of US$5000. Pro women surfers from Australia, Japan and America are expected to join this annual competition that is being organized by the Philippine Surfing Federation and the Local Government Unit of General Luna. Let's surf, meet new friends and have fun in Siargao! Invite your friends to join or witness any of the following activities (which are among the highlights of this surfing event): battle of the bands, bikini open, tropical beach disco with live band, surfing clinic and women's beach volleyball. Siargao's Jomar Gloria surfed his way to the P30,000 cash prize during the first ever Ilocos Sur Surfing Crown. And a special mention goes out to Cabugao's local hero Kido Cabasug for making it to the semi-final round of the two-day surf event held at his home break, Kido's Point. In the Junior Division, goofy-footed Zaldy Coldura of Siargao outsurfed his competitors to take home the championship. The Esquivel brothers Unyot and Jeff took 2nd and 3rd respectively while fellow La Union surfer Bilmar Velasquez took 4th. This was the last leg of the 2006 surf tour which began in February in Baler, Aurora. Congratulations to all the surfers that participated in the tour and thank you to all our sponsors, co-organizers, media partners and followers. Australia's Harley Ingelby wins Lanuza International Longboard Festival in the Philippines! Harley Ingelby (Australia/NSW/Coff's Harbour) today posted one of his biggest ever wins by taking out the Lanuza International Longboard in the Philippines in an all Australian final. Ingelby, the current world professional number three rated surfer surfed superbly all event and maintained his excellent form into the final where he posted two excellent rides, a 9.17 and an 8.13 giving him an outstanding final tally of 18.10 out of a possible 20 to easily win today's final. "What a way to finish such an incredible week in the Philippines! We're all totally stoked on this place, the waves have been so fun, only small but it's such an amazing river mouth set up that it peels perfectly and offers massive scoring potential" said Ingelby after his win today. "I'm honored to win the Lanuza International Longboard and I'll be back next year for certain and I can tell you all of us will be back, we love the place and the people and the waves!" Ingelby secured his win today with his outstanding 9.1 ride mid way through the final when he unleashed a long hang ten nose ride combined with his trademark smooth and complete roundhouse cut back. Gold Coast surfer Jackson Close (Currumbin) finished second today, also posting two excellent 8 point rides in the final. Satisfied with his result Close said - "I can't complain, I had a good final and found some good waves but Harley was the man today - He's very hard to beat in long peeling waves like this"
Sunshine Coast Queensland surfers Grant Thomas (Maroochydore) and current World Champion Josh Constable (Noosa) finished 3rd and 4th respectively in a high scoring final that saw all four surfers post excellent scores. World Champion Constable said after the final - "We've all enjoyed it here and we're very impressed with the wave set up. I'd love to surf it bigger and hopefully that's in store for us next year!" Apart from the final a feature of the day was the Lanuza Bay Bamboo Boards expression session which ran between the semi finals and the final. These high tech. bamboo boards are an amazing product being produced right here at Lanuza Bay. Former Australian shaper Richard Mathews is the creator and has set up production here and the incredible quality boards being produced were put to the test by four of the world's best. Jai Lee, Ian Bell, Dane Pioli and Jacob Struth ripped on these boards, performing all the typical moves from their quarter finals and some more! Ian Bell pulled a successful air on one wave, Lee was outstandingly stylish on the nose, Pioli was typically powerful and Stuth delighted the crowds with a headstand. The boys showed their seal of approval by jointly raising the boards above their heads as they returned to the beach and Bell was later announced winner of the expression session! Congressman "Butch" Pichay, chairman of The Philippine Surfing Federation, announced his intention to at least double the prize money for next year's event following the outstanding success at this year's event which was greeted with wild applause from the large crowd and especially from the competitors. While the waves throughout this year's event were small, the quality of this intriguing river mouth sandbank still dished up long clean peeling performance waves which were unanimously regarded as excellent small waves by all the world professionals here. Even more encouraging for future years is the fact that the North Pacific Ocean is unusually quiet at present as has been highlighted in the Hawaiian Pro events which are running concurrently and those events have had some of the smallest contest surf in Hawaiian North Shore history to date. So this event has delivered and another classic river mouth surf location which is firmly on the global map! Note: Rimat Ti Amianan (San Juan, La Union) is no longer part of the 2006 PSF Circuit. However, PSF lends its support to the La Union Surf Club, who will be handling Rimat Ti Amianan this year. Outstanding field of world rated longboarders heading to Philippines for inaugural Lanuza International Longboard Event. An incredibly talented and select field of elite longboard surfers are set to trek into the surfing Mecca of The Philippines for the inaugural Lanuza International Longboard Event. The line up is lead by current ASP World Professional Longboarding Champion Josh Constable (Noosa/Australia). Constable won his world title earlier this year in Costa Rica where he found some great waves and he appears even more excited about the coming Philippines event saying " It is great that an international longboard event is being taken to a tropical remote location. I hear the wave is like Noosa Heads in Queensland but with more size and that is like my home break and very suited to my surfing so I am certainly looking forward to surfing the wave and competing in this great event". The event will run across a four day waiting period between November 18 and November 21st and importantly, this is prime time for surf throughout The Philippines so expectations are high for another magnificent event with perfect waves. Lanuza sits on the southern coast line in the region of Surigao, an amazingly rich area of high calibre surf including the famous break of Cloud Nine. Reports from the Philippine Surf Federation indicate that Lanuza is the equal of the Cloud Nine surf break, but with it\'s own unique qualities of lining up across a perfect and long distance point break! Experienced international contest director Andrew Stark has done his research on the Philippines and commented on the event and location by saying "The field of surfers we are bringing to this event is absolutely world class. Some of the very best longboarders in the world and the Philippines will be provided a show of longboard surfing like they have never seen before. The wave is so perfect for longboarding and the surfers are all so excited about the event. It will really put Lanuza on the map as a world class surfing destination." Ten internationally world-rated surfers will challenge for the $US10 000 prize pool up for grabs including Harley Ingelby (Coff\'s Harbour/Australia). Ingelby is in awesome form at present following his third place in the ISA World Surfing Games at Huntington Beach earlier this month and the super stylish natural foot surfer is certain to appreciate the perfect peeling waves of Lanuza. Ingelby commented on the event today saying "I have never been to the Philippines but I have heard all good reports of the waves so I am really excited about the event. It is great to have the top longboard surfers in the world in a remote location for such a unique event. It would be such an honour to win the event in its first year as an international event and hopefully it continues for years to come". The eight other surfers to join Constable and Ingelby in this paradise location are Grant Thomas, Brett White, Ian Bell, Jackson Close, Jai Lee, Michael Bellamy, Jacob Stuth and Dane Pioli. Locally ranked longboarders are also set to paddle against their foreign counterparts, making this international event a truly exciting competition for Filipinos as well. The combined talent of this field is set to deliver possibly the highest quality surf event ever staged in the Philippines. Considering the number of outstanding and consistent wave locations along with the amazingly beautiful tropical island locations that these waves are set in, the opportunity to deliver an event of global impact at this inaugural event could well set the pathway for a big future in surfing and this event at Lanuza . Daily Press Releases along with high quality digital images will be dispersed throughout the event. A post event gallery of images will also be available along with an event wrap up press release. Come the 22nd, the event moves on to a National Shorboarding event where locals from Lanuza, Baler, Siargao, La Union, Samar and Zambales are slated to compete for cash prizes totalling upwards of Php100,000. A special wahine expression session is also on the roster of activities. 10 International surfers and 13 of our very own Pinoy waveriders convened at the mighty Majestics reef break in Puraran, Catanduanes with their eyes on the top prize -- a whopping US$2,000. The circuit has now moved on to Guiuan, Samar. The Philippine Surfing Championship Tour keeps its momentum going as it takes the tour back to Eastern Samar. There were more than few grumbles as this previously secret spot was exposed to the surf scene. But what was unfamiliar territory last year has proven to be the perfect spot to nurture a surf community along Eastern Samar's pristine coastline. On October 18 to 21, 2006 the Philippine Surfing Federation, the Municipality Guiuan, Eastern Samar and the Provincial Government Of Eastern Samar, in cooperation with the Department Of Tourism, Region VIII launch the second Eastern Samar Surfing Crown. This will be the fourth leg of this year's Philippine Surfing Championship Tour, which recently wrapped up exciting International and National shortboarding competitions held at Majestics in Catanduanes last October 5 to 12. Surfers from all over the Philippines will reconvene along the largely unexplored reef break to challenge the left and right breaking waves of Calicoan. Last year's event drew spectators from neighboring towns, with special interest coming from the young children who were given a chance to avail of free surf clinics. It is expected that this year's event will draw an even larger number of future shredders. Showing the way are local surfers from Siargao, Baler, La Union and Catanduanes. Will Siargao waverider Dodo Espejon, who squeaked by to win in a heart-stopping 2005 finals, be able to defend his title? Or will another charger slash his way to the top to claim victory? Nobody knows. With the rise in talent among the Filipino surfers, it really is anybody's ball game. Don't miss out on the action! For more information on the Eastern Samar Surfing Crown, email psftour@gmail.com and zenpallugna@yahoo.com.ph.